In science, the key to understanding any situation is careful observations and measurements. The key to observing and measuring, however, is being there—in the moment—and that has always proved challenging for oceanographers. It is difficult and expensive to go to sea, hard to reach remote oceans and depths, and impossible to stay long. Like scientists in other fields, oceanographers use sensors to project their senses into remote or harsh environments for extended time periods. But the oceans present some unique obstacles: Instruments are limited by available power, beaten by waves, corroded by salt water, and fouled by prolific marine organisms that accumulate rapidly on their surfaces. The oceans also surpass the limits of human observation at both extremes. It takes a long and large perspective to measure the exchange of greenhouse gases between Earth’s entire atmosphere and oceans, over seasons or decades. On the other hand, chronicling the transfer of gas molecules at the interface between air and water requires a nanosecond-short, millimeter view. Once again, sensors can extend observations to detect phenomena beyond human capabilities. But it takes a wide spectrum of sensors and platforms to survey whale populations and their global migrations, while simultaneously collecting information on the microscopic plants and animals that whales eat. Today, rapid advances in micro- and nanotechnology, biotechnology, computing power, and sensor integration are fueling development of a new generation of low-power, cost-effective, high-precision sensors that will withstand extended deployments in harsh environments and be able to relay data in real time. What’s more, these sensors will be mounted on an expanding variety of observatory platforms that provide unprecedented access: satellite imaging systems, autonomous underwater vehicles carrying sensors on wide-ranging surveys, and ocean observatories with cables that continuously transmit power to instruments and send their data back. In July 2003, the WHOI Ocean Life Institute and Deep Ocean Exploration Institute, along with the National Science Foundation and the Office of Naval Research, sponsored a workshop called “The Next Generation of in situ Biological and Chemical Sensors in the Ocean.” It brought together ocean scientists and engineers with colleagues from the fields of biomedical technology, nanotechnology, and electrical engineering to explore new approaches and possibilities for ocean sensors. The workshop presented an exciting vision and road map for sensors in the not-so-distant future that will allow quantum leaps in what we can observe and discover in the oceans. Our decade-old dream is now becoming a reality: to be able to observe phenomena in the ocean continuously, on all scales and in real time, and to be able to interact with sensors in the oceans—all from shore. Oceanographic sensors come in all flavors: They measure light, temperature, sound, mass, or chemical species. All of these senses will be needed to gain the full picture of all the interacting physical, biological, and chemical dynamics going on in the oceans. Scientists have a fairly good idea of what we need to measure in the ocean. To study ocean pollution, for example, ocean chemists require sensors that detect synthetic compounds, such as those derived from plastics and petroleum products, automobile exhaust, storm and sewer runoff, pesticides, fertilizers, surfactants, and chlorofluorocarbons (Freon). To understand how chemical cues help organisms find food, or initiate mating or spawning, we need sensors to identify complex organic molecules and learn their concentrations and persistence in the environment. To determine whether the oceans can absorb excess greenhouse gases, we need sensors that measure climatically and ecologically important gases such as carbon dioxide, methane, hydrogen, hydrogen sulfide, and radon. Other chemical sensors can indicate how much carbon dioxide is converted by photosynthetic plankton into organic carbon, and how much of this sinks to the deep ocean—to mitigate the buildup of greenhouse gases, or to feed hungry populations of deep-sea organisms. All these sensors, along with others that measure seawater properties such as temperature, salinity, and turbulence, will let biological oceanographers begin to see how ecosystems work and how they change over microseconds to decades. To learn how organisms respond to changing habitats and interact with each other, oceanographers first need to determine when and where species are present, from bacteria to whales. To identify organisms over the scale of microscopic plankton (micrometers) to a full ocean (thousands of kilometers), scientists need systems that integrate optical and acoustic sensors, which give complementary information. Sound propagates far in water, providing information over long distances. But it travels in long wavelengths that yield only low spatial resolution. Light, on the other hand, scatters quickly in water, but travels in short wavelengths, giving us high-resolution information on small organisms and their “spheres of influence” —a few body lengths around them. Some integrated systems already exist. One is the Bio-Optical Multifrequency Acoustical and Physical Environmental Recorder, or BIOMAPER-II, developed at WHOI, which was used recently to survey krill populations around Antarctica. (See “Voyages into the Antarctic Winter”) Towed behind a vessel, BIOMAPER-II carries an acoustic system to detect small marine organisms such as krill or plankton, a video plankton recorder to take pictures of them, and other sensors to measure water properties. But just knowing the locations, concentrations, and types of species is still not sufficient. Scientists also need information on organisms’ feeding, growth, and reproduction. Integrated systems will soon carry sensors that sample, analyze, and identify biological molecules—among them DNA, proteins, enzymes, and lipids­—that signal biochemical activities. Exciting additions to our sensor arsenal are already being developed. 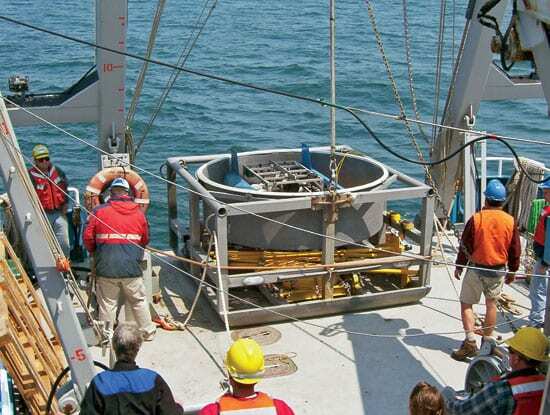 To begin to measure tiny “needles” of dissolved gases, trace metals, elements, and nutrients in the “haystack” of the oceans, several new approaches show great promise. Laser-Induced Breakdown Spectroscopy (LIBS) uses a laser to vaporize tiny amounts of a material and determine its elemental composition based on the light spectrum it emits. WHOI scientists are collaborating with the Army Research Laboratory to develop oceanographic sensors using LIBS. Raman spectroscopy uses laser light to cause tiny samples of water to vaporize and the molecules in the water to vibrate. That changes the spectrum of light scattered from the molecules, thus revealing many high molecular weight compounds in the water, including large organic molecules such as lipids, proteins, and amino acids. Raman spectroscopy can also be used to detect dissolved carbon dioxide. It may soon be possible to identify microorganisms in seawater by scanning it with light and measuring the way they scatter light at different wavelengths. Miniaturized equipment to make this measurement already exists, and advances in mathematical analysis techniques (known as spectral deconvolution) may allow us to detect the species, concentrations, mass, chemical compositions, and even nucleotides (components of DNA) in seawater samples. Scientists are just beginning to measure chemicals in the extremely harsh conditions of hydrothermal vents and seeps, where the high temperatures (up to 400°C or 750°F) and corrosive nature of hydrothermal fluids make them almost impossible to sample directly with sensors. A promising technology for these conditions, called voltammetry, simultaneously detects a variety of chemical ions including oxygen, hydrogen sulfide, iron, and manganese. Voltammetry employs electrodes to scan seawater with a range of voltages while measuring the electrical current output occurring in response to the voltage scan. This output is recorded as a spectrogram: a graph of multiple peaks in which the location and height of the peaks are proportional to the types and amounts of ions in the seawater. But all these sensors are of little value unless they can get out into the ocean and stay there. Autonomous underwater vehicles (AUVs) are one way to accomplish that mission, but oceanographers have also been developing exciting new cabled observatories that provide continuous power to plugged-in instruments and two-way communications to scientists ashore. Developed and developing observatories are being located to study various ecosystems, including productive coastal areas, harbor entrances, or regions under polar ice. At WHOI, the Martha’s Vineyard Coastal Observatory will soon become the homeport of a new observing platform called the Autonomous Vertically Profiling Plankton Observatory (AVPPO), which is designed to observe daily, seasonal, and annual changes in the coastal Atlantic Ocean ecosystem (see interactive at left). A winch system drives a platform on a 15-minute trip from the seafloor to the surface. 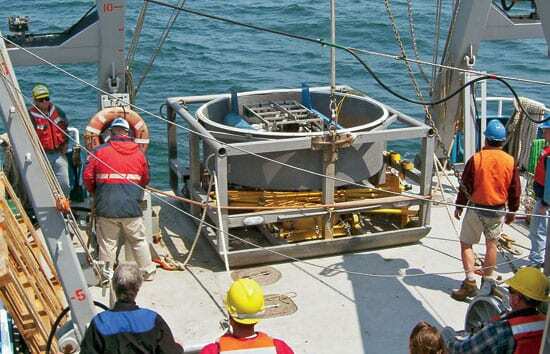 It is equipped with a range of instruments—35 sensors in all—that measure salinity, temperature, oxygen, water motion, water turbulence and clarity, light, chlorophyll, organic matter, the amount and types of zooplankton and phytoplankton present, along with the platform’s own orientation in the water. These measurements can be correlated with weather and storm events and will help us monitor the coastal ecosystem’s response to climate and other changes. A similar instrument, the Polar Remote Interactive Marine Observatory (PRIMO), will soon be installed under the ice in the Southern Ocean and cabled to shore from Palmer Station on the western peninsula of Antarctica. It will be the first cabled remote observatory in the harsh Antarctic environment and our first long-term, real-time look at this fertile ecosystem that supports a wealth of marine life. PRIMO will transmit data via cable and satellite and give researchers and students a direct link to critical phenomena and events, including storms, currents, sea ice formation, and the spring phytoplankton bloom that fuels an entire food web. It will also provide clues on how this delicately balanced ecosystem might respond to the receding ice edge and other changes related to climate. Like other observatories, PRIMO will be used in concert with AUVs by including docking facilities for AUVs in the future. We have entered a new era with a changing paradigm of how we sample the ocean. We soon will “wire the oceans” with instrumental “eyes, noses, and hands”—which can’t help but dramatically expand our understanding of what’s going on in the oceans. Stay tuned, the best is yet to come. Workshop: ?The Next Generation of in situ Biological and Chemical Sensors in the Ocean?